So I have a special party to go to tonight I am going to blow out my hair for a change. I haven't done this in months but I like the look on peoples faces when they see change......especially my fiance. I think he prefers me with straight hair! Anyways.................I will post pics before I go out because I am now obsessed with posting pics! If I'm feeling funny, I will even post pics from when I get home from the party to show you all the poofy mess it has become from being outside. HEHE! ETA: Straight hair pics. I think curly looks better. Plus, my roots are more visible when my hair is straight and I'm gonna have to do a good DT to get some moisture into my dry ends. Starting my curly resolution! 3a/3b with some waves thrown in. Haven't been CG in a while. Need product suggestions. No, even when I was wearing a relaxer I was obsessed with making my hair anything but straight. Isn't that the opposite of making sense? I just thought one had to wear a relaxer; it was what we do. Now to find out I have curls and waves and kinks....I'm loving life. I can't wait to cut off the rest of this relaxed hair. I need more length, but I'm getting there. Yea I don't think I could have straight hair permanently. I really do love my curls! But once in a while its fun to straighten for a change. P.S. Its so much more fun buying products for curls anyways! No way! Once I learned how to take care of my curls, I began to love them! I can't live without them now! I think well-cared for curly hair is 10x prettier than well-cared for straight hair...in most cases. Bah, curls are so underrated! well, before I found this site (which is about 4 days ago) I was on the brink of getting my hair straightened, but then I read here that there are millions of ways to take care of your curls and still make them look good. i'm not there yet, but i'm working on it. No way. I have no desire to straighten my hair permanently. I like the versatility that I have with my curls. I can wear it natural or straight. Been there and done that(w/ relaxers), and have no plans on going there again. You know what? As much as I love my curls, I have to admit that I'm not confident in my answer to this question. There's something to be said for being able to pull a brush through my hair and fix whatever's ailing me. No way I'd do it if it were at all damaging, though - I hate that fried over-straightened look, it's revolting. i've got to be honest, i would seriously think about it. i love my curls, but i hate that they are inconsistent (never know how it will turn out) and that i spend so much time/money/effort on the perfect products and routines. it would have to depend on how straight it would get too - if it would look like my own hair when it's blown out, and promptly pouf out after stepping in humidity, i would pass. but if it would just look like naturally straight hair, i'd seriously consider it. it would save so much time, money, and effort. This is going to keep me up all night thinking about it. The thought of having long, straight ,silky, shiny hair without effort....that would take some time to decide for sure. 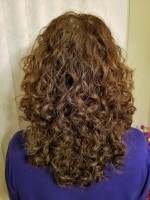 I do finally love my curls (after 48 years! ), but that's still a toough question for me. I voted to keep my curls. I´m learning now to take care of my curls and, for the first time, I´m quite enjoying it. I think that having permanently straight hair is absolutely boring. I find it interesting to see how my curls behave, as if they have their own personality. I absolutely wouldn't. I have had my hair straightened about 4, maybe 5 times in my whole life and my DH told me that I look weird that way! I pretty much never feel like having straight hair, even on my worst hair days. I had to go with seriously think about it. If I was single, I'd go with yes, but my husband likes waves and curls and he's wonderful about encouraging me to keep the curly look . I've learned to get along with my hair after all these years (and years) and if my hair was thick on top, that alone would have had me saying "no way". I do, however, think my face looks better with straight hair and bangs, which I do straighten even now. For me, becoming friends with my waves/curls has been a very good thing and my hair has become healthier for it. The top of my head is always a daily "what's it gonna do today" thing and that's really the only frustrating thing about my hair. And I do enjoy my "PJ-ism"
My nature is curly, I just didn't know it before. Straight or flat hair is not my most flattering look. I have finally realized I look my best when my hair tells me how it is going to fall, and I just make suggestions. Exactly! I have not straightenend my hair in over 26 years! (Well, ok, I did once so hubby could see it when we first got married 13 years ago.) Never again! It's just NOT ME! I've finally accepted my curly hair. It's so me! I've also invested so much time & money, so I think I'll pass. It's easy enough for me to straighten my hair. I just don't want to. I like my curls now. Back when I didn't know how to treat my hair, and it was just an unmanageable poofy mess, maybe. But not anymore. Straight hair just looks so generic to me. I've always embraced my curls! I went to high school smack dab in the middle of the 80's, when big hair was well, big! 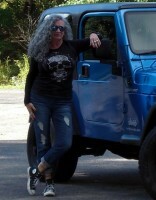 I fit in perfectly and didn't have to pay $$$$ for a perm like all my friends Now had I gone to high school in the 90's when stick straight hair was the thing, I think maybe I would feel differently. I wouldn't want them gone - I'd just like them to loosen up a little! That also goes for a few people I know! I have to say I would, don't even have to think about it (runs away and hides in embarrassment). Once upon a time I would have said yes to permanently straight hair. But not anymore, I think curly hair is way more interesting & individual than straight hair. When I used to straighten regularly I always liked to leave a bit of a wave, I think that looks more natural than poker straight, totally flat hair. A couple of weeks ago I was going out for a meal with my SO & I decided to dig the straighteners out (1st time in months) mainly to see how long my hair had grown. Well it looked bl**dy awful!! It really seemed to drag my face down & didn't look 'me' at all. I didn't have time to re-wet so ended up putting my hair up in a twist which actually looked really good with the straight hair. I bet straighties have bad hair days too. Hard to believe, but could be true! I voted to keep my curls. Sure, sometimes I pine for long, silky straight hair that I can brush to my heart's content, shampoo as much as I want to, and consider it frizzy when there's a couple flyaway hairs, but I have realized that my curly hair is part of what makes me me. My hair is unique and no one in the world has hair exactly like mine. I love straightening my hair every once in a while for that shock effect, but I don't feel completely myself until I get my curls back. I figure God created my curls, and so I'm keeping 'em! Nah - straight is okay, of course you still look lovely, but as I said, straight hair just always looks so generic to me. Keep rocking your gorgeous curls!!! Thanks! After 2 days with straight hair, I am excited to go back to curly!!!!! The last time I did it, I came home and wet it that very same night - it was kinda fun for one night, but it just felt sooooo weird and not me! Styler: BRHG (over any and all curl enhancers) - this is the one product that I never change - absolute HG!! Your hair looks fine straight, but I agree that it looks WAY better curly! It really suits you.